Blue Nose race weekend has come and gone and for Team Love4Gambia, the weekend was full of… love. For youth and communities in my beloved Gambia. We had 92 runners and walkers complete the Blue Nose Marathon’s race events. These people raised a phenomenal $24,100 for The Gambia and the Nova Scotia-Gambia Association. I can still hardly believe the generosity, kindness and energy for giving displayed by these 92 beautiful people. I knew that the length of The Gambia was 430 km. I knew that it would be hot and humid and rainy in July. I knew that this run would be tough but that the money raised would go a long way for youth and communities; that it would save lives. I did not know how spectacularly generous people would be. I had no idea that 114 people would show up for me, for Gambia. That they would embrace my cause and sign up for my team. I had no idea that 68 people would raise more than the $100 minimum I asked them to raise. My sponsor Luke from Aerobics First and I bravely set our prize giveaway at $500, aware that we may not be able to give our prizes away. I can’t describe to you the joy and gratitude that I feel when I look at my fundraising page and see that 17 people raised more than $500 each. These people deserve recognition. They are: Jeff Covert ($880), Hiya Field ($850), Lori Wood ($735), Megan Aston ($720), David Kachan ($710), Gina O’Leary ($650), Edwin Callaghan ($610), Kate Keast ($565), Jakob Conrad ($545), Robert Hughes ($540), Marie Leslie ($522), Theresa Callaghan ($510), Kristen Callaghan ($500), Mike Juurlink ($500), Sarah Chiasson ($500), Mary Catherine Connolly ($500). I have no idea how to properly thank these 92 people for the incredible thing that they have helped us do for communities in The Gambia. In 2010, more than 1000 kids under age 5 died of malaria. When the number of malaria deaths in 2011 is less, I hope my Love4Gambia runners and walkers will feel a Gambian mother’s gratitude in their hearts because they will have helped make that happen. I tried to focus the best I could on my 10km race on Sunday. My fitness has been really good this training cycle but for a variety of reasons, I haven’t been pulling off the race results that my fitness should produce. I was worried about a number of things all week, mostly related to team logistics, but was also worried about not being able to focus on my race amidst team duties. I made sure that I had no responsibilities race day. I ran to the start of the course with Candice and warmed up. We almost blew our race by leaving our entrance to the start corral too late. Five minutes before the gun went, we were behind 3000 people. Eek! Luckily, skinny girls can squeeze through a crowd. With as little pushing and shoving as possible, we made a mad dash to the front. If I stepped on your toes while doing this, I’m sorry. We got to the front in time for me to give Mike a quick good luck hug and then the gun fired. Go time. 10km is my most challenging race distance. For me, it’s a long time to run fast. I prefer the half marathon where you can run a little slower for a little longer. I had a race plan, developed with coach Cliff, and ran the first 3km on planned pace. If I don’t “hate running” during a 10k race, then I call it successful. I know that I need to focus my mind so I that I don’t begin to hate running and often I use a mantra to do this. As I turned onto the bridge, I needed to focus. “My team. My course” popped into my head, pushing out all hateful running thoughts. The effort was hard but I could do it thinking about how I owned these streets and that I was out there with MY 92-person team. The TSN turning point of my race was after the turnaround when I started running back by my friends and Love4Gambia teammates. I saw Candice first and she looked focused and fine. Then I saw Lori who was yelling wildly at me and wanted either a wave or a high five. I wanted to high five her badly but held back. 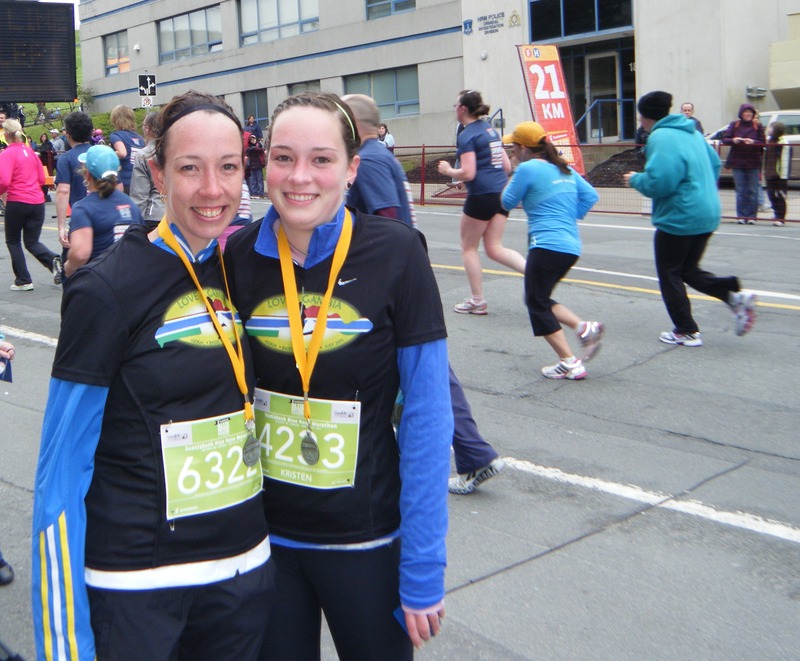 I knew that up next was my beautiful baby sister Kristen, who was running her first ever race. As soon as I saw Kristen coming up Nantucket with a beaming smile, running on the outside of the crowd so we could meet, my choice was easily made. Hands held out, we connected in a triumphant high-five. My sister looked amazing and I felt amazing. I proceeded to wave at Rob, Dawn, Andrew, Emma and Michelle & gang. I high-fived Stu. I high-fived Harrison. I high-fived Dave. I was slightly worried when a woman told me that I was the fourth female and that I could still catch the third place woman. What if she also told the fifth place woman that! 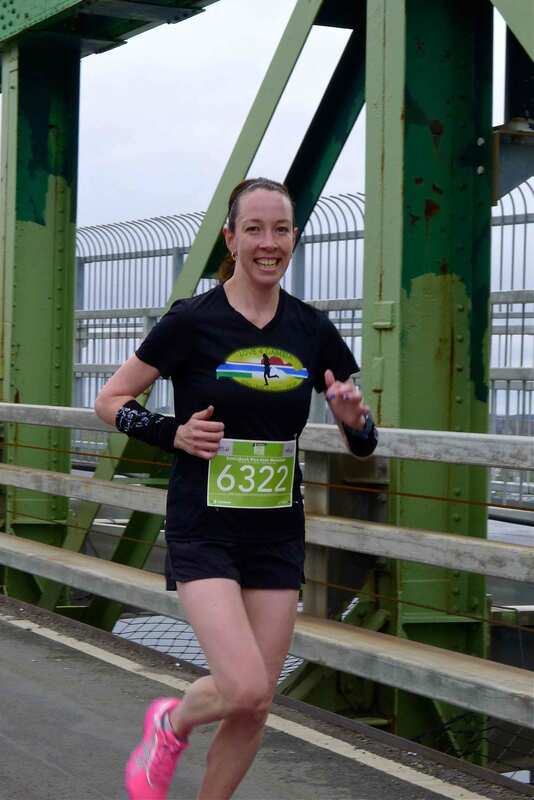 I didn’t run the bridge well on the way to Dartmouth but held my pace better on the way back. I saw my former coach Matt at 1500m to go and he told me to stay tough to the finish so I did. Well, until I saw my family, Melissa and Joanne, who wanted a photo so I happily obliged. My Garmin rang 10k well before the finish line. The course was long- 10.27km according to my Garmin. I finished 39th overall and ran most of the course alone, no one next me, so I know that I was running perfect tangents. I would expect a Garmin to read 10.05 km maybe but not 227m long. Many of the fast men who I spoke with after also had Garmin readings of 10.27-10.3km. I finished in 43:42, not even my best Blue Nose 10km but a happy one. I held onto 4th place female and my prize for being 3rd in my age group was an Adidas hat. The best prize though was that high five from my sister Kristen. This entry was posted in Fundraising and tagged 10km race, Blue Nose Marathon, Charity, Gambia, Malaria, mantra, sisters, team. Bookmark the permalink. What a great re-cap! You’ll have many races in your future to focus on fast-ness…kudos to you for relishing in the family- and friend-ness of this one. Oh, and also for being the motivating force behind $23,000 being raised for people a world away. It was an awesome weekend Erin. You should be very proud of all you have accomplished so far. We are all very proud of you. 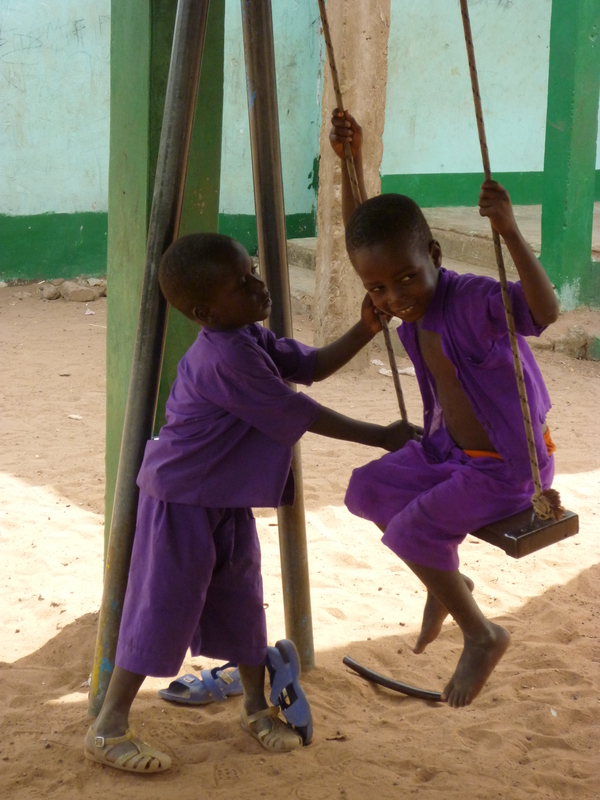 The children of Gambia will appreciate all of your efforts I am sure. Saving many young lives in the process. Great work Erin! It was an honour to be a small part of this initiative. You are an awesome person that does so many great things to help others. and wow, 4th place in such a huge 10K field is very impressive! happy training and have a great experience in July! thanks so much Jenn for being involved! It was really great having you on the team.